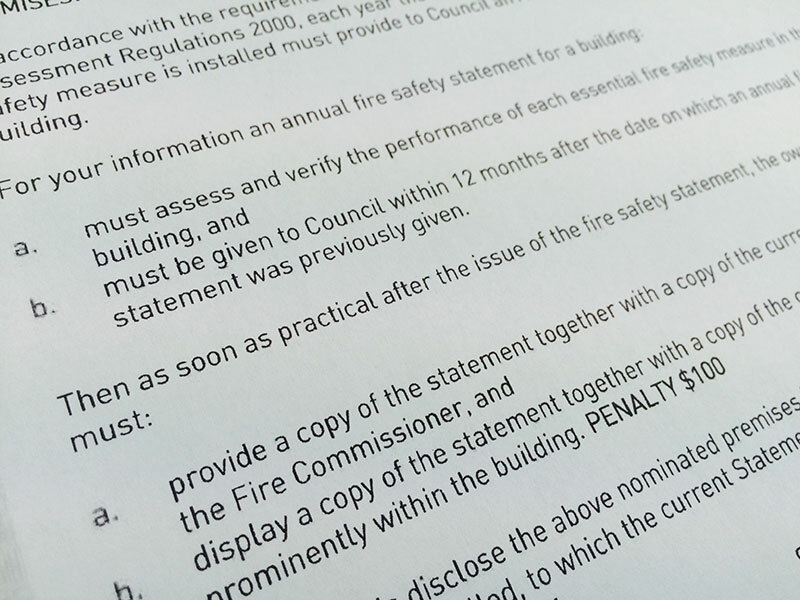 The NSW Environmental Planning and Assessment Regulation (2000) requires building owners to submit a Fire Safety Statement to the local council and fire brigade annually. State One Fire consultant teams have many years of operational experience in the NSW Fire Brigade and excellent knowledge of relevant Australian Standards and the Building Code of Australia. Our consultants are industry leaders in testing, maintaining and repairing fire protection systems. With specific expertise in building maintenance and safety, State One Fire can provide Annual Assessments, BCA Assessments and Fire Upgrade Assessments. Our qualified consultants has experience across a wide range of building types such as high rise commercial buildings, aged care facilities, residential strata buildings, retail business, clubs and restaurants. Regular inspection and maintenance of fire protection systems is essential as it is required by law in most circumstances, e.g. Section 166, NSW Environmental Planning & Assessment Regulations (2000). Our consultants will determine when the fire safety measures were installed in your building and research the performance standards that were applicable at the time (not today’s standards). The fire systems listed on council’s schedule exist on your premises, and are correctly listed by council. The fire systems can perform to the relevant Australian Standards and legislation. Changes to building structure or use effect fire system performance. The fire equipment is correctly located and has no obvious damage. The routine inspection, testing and servicing is being performed and any defects found have been rectified. The status of the paths of travel to the exits including the exit doors, in connection with the relevant state regulations. A detailed report, including photos is prepared. Identifies fire measures and their relevant standards. Reports on the measures’ capacity to perform to their relevant standards. Recognises relevant issues in respect to paths of travel to the exits. Identifies and classifies any defects. Includes a Fire Safety Statement prepared for the building owner (or the owner’s agent on behalf of the owner).